Following a standout past few years, Sam has established himself as one of the leading salespeople for the marketing and sale of luxury and distinctive properties in Queenstown, New Zealand. Having formed a highly successful partnership with Colleen Murfin in 2014, Sam and Colleen have coordinated a number of notable sales through the Lakes District and built a reputation for their professionalism and delivering results at the highest level. Sam started his real estate career in 2002 and has been responsible for many significant transactions over this time. With a wealth of experience, exceptional market knowledge and extensive networks throughout New Zealand and abroad, he is ideally positioned to best serve those in this specialist market. 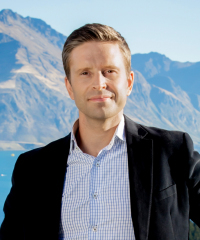 A passion for real estate and a reputation for providing the highest level of service, Sam is recognized as one of Queenstownâ€™s preeminent salespeople in the premium property market.